This entry was posted in Podcast on 2009-03-29 by epicdeer. A glove epidemic! 90210 On Ice! John Baldwin ages before our very eyes! And Cleveland loans! This entry was posted in Podcast on 2009-03-27 by epicdeer. Some of you have told me, “But you never left iTunes. I got the latest episode no problem!” And I believe you. Really I do. I think that was because those listeners had perhaps subscribed to the website feed through the iTunes player. Other listeners, who subscribed through the iTunes page, were out of luck—iTunes wasn’t updating the feed. I was not successful in changing that, so I asked Apple to delete the old iTunes page and create a new one. I want to thank all of you for hanging in there, babies. This is a big season for us—we’re going to Worlds! So please keep listening. This entry was posted in Behind the Scenes on 2009-03-09 by epicdeer. Hello, skating fans, it’s great to be back! Has Kimmie Meissner gotten any better while we’ve been gone? Let’s find out! 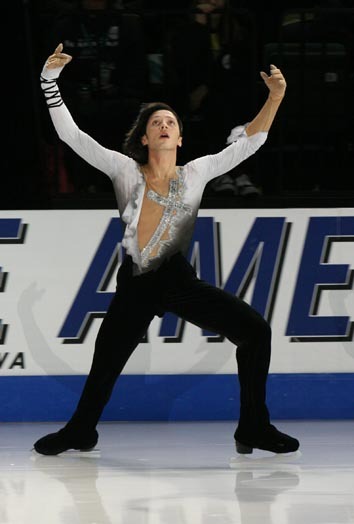 Weir performs an Ina Bauer during his exhibition program at the 2008 Skate America. Photo by David W. Carmichael. Season 2 opens with a bang! Well, really, it opens with some violins (key of F.) In this episode, Kimmie eats her spinach. Johnny Weir and Evan Lysacek continue THE GREATEST RIVALRY IN ALL OF SPORT. Mirai Nagasu stretches. Rachael Flatt, self-title skater. And… THE ICE QUEENS ARE GOING TO THE WORLDS! This entry was posted in Podcast and tagged 2008 Skate America, Evan Lysacek, Johnny Weir, Kimmie Meissner, Mirai Nagasu, Rachael Flatt on 2009-03-07 by epicdeer.